We all have different methods of getting to sleep at night. Some use hot tea and reading to wind down, while others soothe their minds with some tunes. Whichever way you choose to do things, it’s always better with a nice, cozy blanket. Multi-functionality makes things easier, so why not combine two ways of relaxing into one? 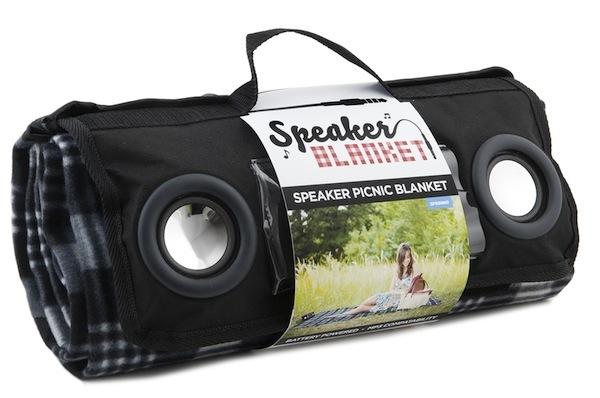 The Speaker Blanket keep you warm and lull you to sleep. It has two small speakers which run off of a AA battery. If you don’t want to fill the room with sound, there’s also an option for headphones that fit a 3.5mm jack. This would be perfect for picnics, a leisure day at the beach, or just snuggling up at night. This is only available for pre-order at the moment, and will cost you around $53.